Michael Wacha finished his first postseason with a 4-1 record, 2.64 ERA in 30 2/3 innings. ST. LOUIS — St. Louis starter Adam Wainwright understands if Cardinal fans believe Michael Wacha is the future. Even though he finished 19-9 last season with a 2.94 ERA, second in the Cy Young balloting, he knows why there is so much buzz about Wacha. One of the most promising young arms in baseball, Wacha wowed everyone with his performance late last season. Wacha posted a 2.78 ERA in 15 regular-season games in his rookie season. However, the starter from Texas A&M made five postseason starts for the Cardinals that has everyone excited to see what he can do in 2014. "Michael, if he does what he did down the stretch and if he does that for a whole season, he’s going to be in the Cy Young talks," Wainwright said Saturday at the annual Cardinals Winter Warmup. "I think Michael may be one of the most talented pitchers I’ve seen. He’s a guy who almost threw a no-hitter and then almost threw another no-hitter. "I’m very, very impressed with his game. I’d like to see it through a whole season." 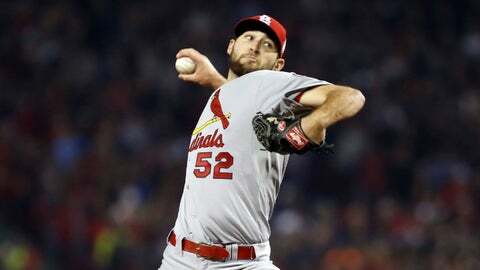 Wacha came within one out of a no-hitter before allowing an infield single to Washington’s Ryan Zimmerman last Sept. 24. His late-season success helped him nab a spot in the Cardinals’ postseason starting rotation ahead of fellow rookie and 15-game winner Shelby Miller. Wacha did not disappoint. In Game 4 of the NLDS against Pittsburgh, Wacha allowed one run on one hit and two walks with nine strikeouts over 7 1/3 innings. He carried a no-hit bid into the eighth inning. Wacha then outdueled Clayton Kershaw in the Cardinals’ 1-0 victory in Game 2 of the NLCS. He also bested Kershaw in Game 6. Wacha finished the NLCS with 13 strikeouts in 13 2/3 scoreless innings to earn MVP honors. He got the start in Game 2 of the World Series and helped the Cardinals to a victory. His magic run ended in Game 6 when Boston erupted for six earned runs on five hits and four walks, chasing Wacha from the game after only 3 2/3 innings. Wacha finished his first postseason with a 4-1 record, 2.64 ERA in 30 2/3 innings. Last March, the Cardinals signed Wainwright, who did not go through free agency, to a $97.5 million, five-year contract covering 2014-18. Wainwright is 99-57 with a 3.11 ERA with St. Louis. Meanwhile, Kershaw recently signed a $215 million, seven-year contract with the Los Angeles Dodgers to make him baseball’s richest pitcher. "I have no regrets," Wainwright said. "That was the deal I wanted to sign. I didn’t have to sign it. I’m right where I want to be. I love pulling up every day and seeing the Arch and the stadium. We have a chance to win every year." He is anxious for another chance to pitch in the postseason after losing his last three starts. "I just think we have a great team. We have a great chance to go far into the playoffs and make another World Series run," Wainwright said. "We have to out there and make it happen."